Twomey's in Kimmage, Dublin 12. WALK AROUND A city long enough and chances are you’ll stumble upon some remnants of a forgotten era. A faded shopfront, for instance, or a vintage advertisement. 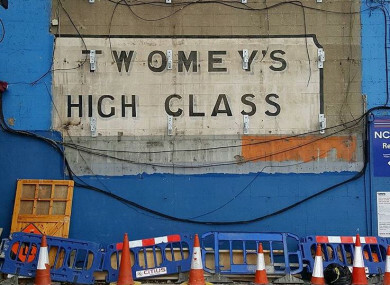 Since 2013, Emma Clarke has been photographing these little urban anomalies on Dublin Ghost Signs, a blog dedicated to “capturing Dublin’s history through its old and faded signs”. The term “ghost sign” typically refers to signs painted into brickwork that have begun to fade. But Dublin Ghost Signs also includes hand painted signs on wood, mosaic doorsteps, metal signs, and stone carved signs. I remember taking a photograph of the Georgian Restaurant on South Richmond Street in 2009, and shortly after I took the picture, some hoarding went up and obscured it. Clarke decided to try documenting old signs and empty buildings before they too disappeared. Her collection of photographs was soon large enough to merit a blog. Dublin Ghost Signs started publishing in 2013 and has been going ever since. Since then, it has taken on a life of its own, especially on Instagram, where people post their own photos under the #dublinghostsigns hashtag. If a sign is really faded, it can be hard to decipher, but I find if I post it online someone usually comes back quickly with information about the sign or the business. Clarke commends businesses who incorporate elements of a building’s past into their business, like the recently reopened Laptop Lab on George Street, which retained the building’s original outdoor signage. But she is conscious that this isn’t always possible and that cities have to move on. That’s precisely why it’s important to document the signs before they – and the stories behind them – are lost to the annals of time. In addition to running her blog, Clarke is set to partner with Space Engagers to create a Ghost Signs of Ireland crowdsourcing project, which will see her map Ireland’s ghost signs using the Space Engagers app. The project will launch later this year. We asked Clarke to give us a small tour through some of her favourite Dublin ghost signs – and to share the fascinating stories behind them. This ghost sign for ARKO Amusements is located in the alleyway beside Wynn’s Hotel. The amusement arcade was at the centre of a court case in the 1950s in which it was claimed that one of the games on the premises was rigged and could not be won. This is an interesting one. In 2017, an old shop sign was revealed on Capel Street during a refurbishment. If you look closely above the Walsh’s sign, you can see a faded American flag and a very faint trace of a ghost sign for the American Hotel which operated at 159 Capel Street in the 1930s. Moore Lane is one of Dublin’s most unloved lanes, but if you take walk down there, you’ll find many traces of the past like this old stone carved sign for J&G Campbell‘s tea. ‘Campbell’s Perfect Tea’ has been a part of Dublin life since the late 1700s. The buildings along this part of Usher’s Quay have remained unchanged in recent years. Anderson Furniture is a ghost sign above the post office. To the left is a boarded up creamery and to the left of that (out of frame) is fire damaged TP Nolan’s. There was a time when leather manufacturing was one of the biggest industries in Ireland and Dublin’s Watling Street was home to a number of tanneries. I can only imagine how bad it must have smelled around there! Montague Burton was a clothing manufacturer and retailer. At its peak, Burton had around 600 stores in the UK and Ireland, including this one on the corner of Dame Street and South Great George’s Street in Dublin which still bears the company logo. For more information visit the Dublin Ghost Signs blog or follow @dublinghostsigns on Instagram for updates. Email “The faded history behind Dublin's 'ghost signs' - and 5 to look out for around the city”. Feedback on “The faded history behind Dublin's 'ghost signs' - and 5 to look out for around the city”.